Once again I have the pleasure of showing you the four latest collaboration shades released by Picture Polish. I know I sound like a broken record when I say this, but I really love what Picture Polish are doing with the collaboration shades. I love how much they are sharing them around the world and I think there have now been more than 30 collaboration polishes, and I hope there will be lots more to come. Bewitch - by The Obsessed. This one is quite an interesting mix. The base is a dark aubergine purple, but the overall feel is more a vampy brown. That is because of the generous helping of gold shimmer particles. 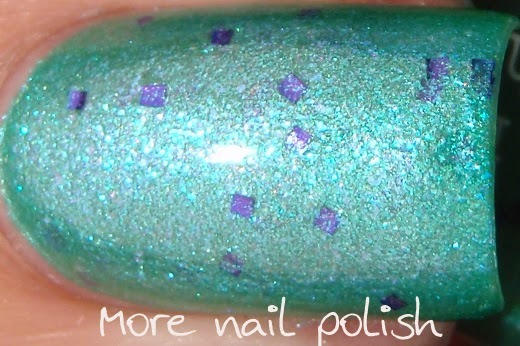 There are also some of those scattered holo particles that you find in other Picture Polish shades. As usual, application was great. In the full sun you can see the jelly transparent appearance to this polish at my tips, but even though it's jelly like, its perfectly opaque at two coats. Moody blues - by Polly polish. 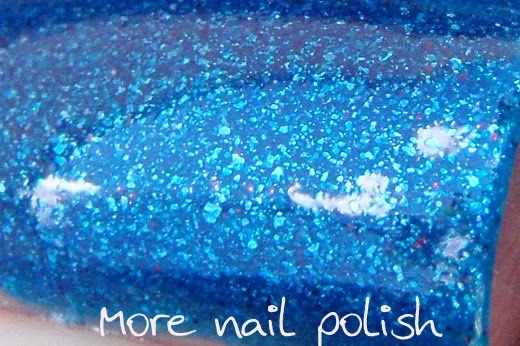 A dark cerulean blue with micro ruby glitters. The blue shimmer in this is more like a glass fleck. The red micro glitters are not very obvious in photos, and even in real life they are quite subtle, but you certainly do see the red flashes quite often and they add more interest to the polish. Again, perfect formula. This is two coats with top coat. This is not a great macro shot, but you can see the size of the blue glass flecks and you can also see some glowing tiny red dots gently scattered across the nail. 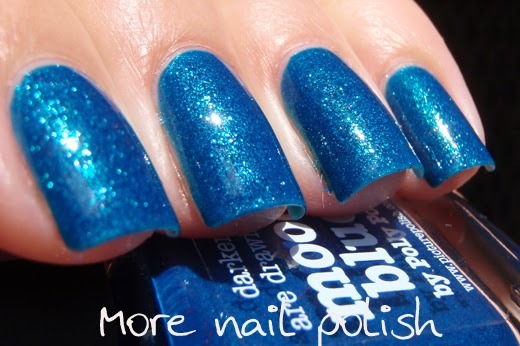 This polish has lots of depth. Serenity - by Polished Peripherals. Naturally, I have a bit of soft spot for my fellow Aussie collaborators. This first one comes from Rebecca and I've read her blog forever, probably since she first started it. I enjoy her blog posts as she puts snippets of her life into it, and I can totally relate to her stories with her little kids. 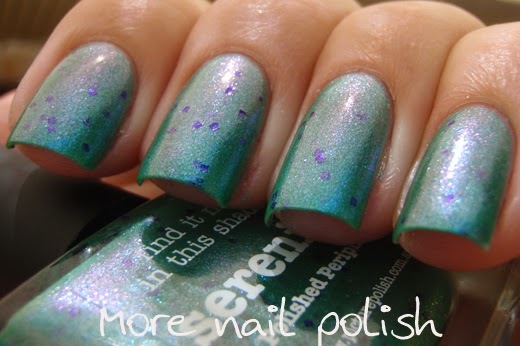 I remember way back in Jul 2013 when I was one of the very first to share my Picture Polish Collaboration shade, that Rebecca had received a bottle of Kryptonite for blog fest. Her pictures of Kryptonite were simply incredible - as well as the nail art she created, and I knew way back then that she would have to receive a collaboration shade for her efforts - it just took a while to get through the list. Anyway, lets look at Serenity. Serenity is a shimmery blue green base with a subtle lavender haze that can best be seen at angles, which makes this a little bit of a duochrome shimmer. 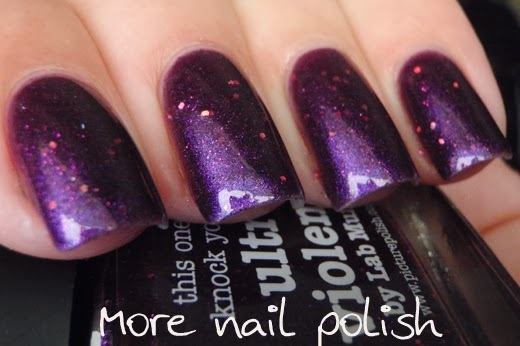 There is also a light sprinkling of square purple glitters that just add a little sparkle and don't turn the polish into a glitter bomb. Excellent formula and opaque at two coats. Ultra violence - by Lab Muffin. The second Aussie collaborator in this release and also another of my favourite blogs to read. Michelle's blog combines her science smarts with her love of polish and beauty, and her blog posts are always an interesting read. Michelle isn't a huge fan of sparkly and shiny things on her nails, so I think this polish must be about a shiny and sparkly as Michelle could comfortably get. This polish shines, but then again it also appears quite dark and mysterious in the right lighting conditions. This polish definitely has two personalities. The shimmery purple base can appear quite dusty and subdued in indoor and shaded light, but in the sun this polish is so very sparkly. I'm also totally in love with the gentle sprinkling of holographic magenta glitters. This is two coats with top coat. So there you have it. The latest four picture polish collaboration shades. What do you think, will you be picking any of these up? I wonder what new collaborators will bring next year? All these shades, as well as all the other Picture Polish collaboration and regular shades are available directly from Picture Polish in Australia, or through their network members around the world. 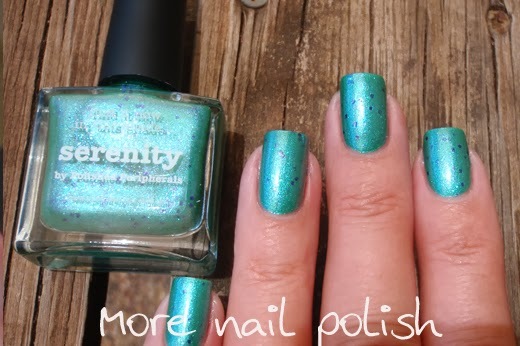 awww you say the sweetest things :) So glad you like Serenity and it's such a thrill to see it on your nails. These are all beautiful, but Serenity is the one that's calling my name. 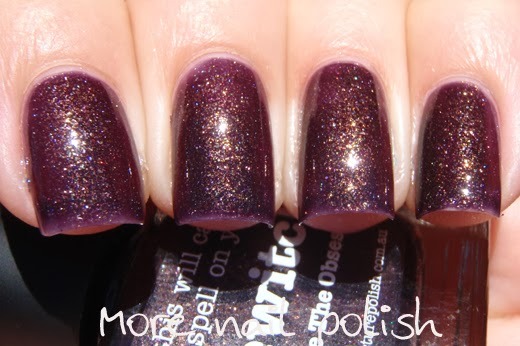 Bewitch is gorgeous! I think it's quite unique too, at least to me. These are beautiful! Oh, if I could just have them all..
Also.. you said it was way back in July 2013 that Rebecca swatched your Kryptonite polish. Was it in July 2012? Sorry, just wanted to check. Serenity is my favorite of these. I feel like it's more unique than most.